Learn to paint and color beautiful illuminated letters in this creative hands-on class. Using Tsukineko Inks and Fabrico Markers, you will explore techniques that will add stunning detail and sparkle to your projects. No prior painting experience is required; just a desire to color, create and play. Each student will choose one letter to paint. Contact Jaimie to specify your choice(s) of letters. 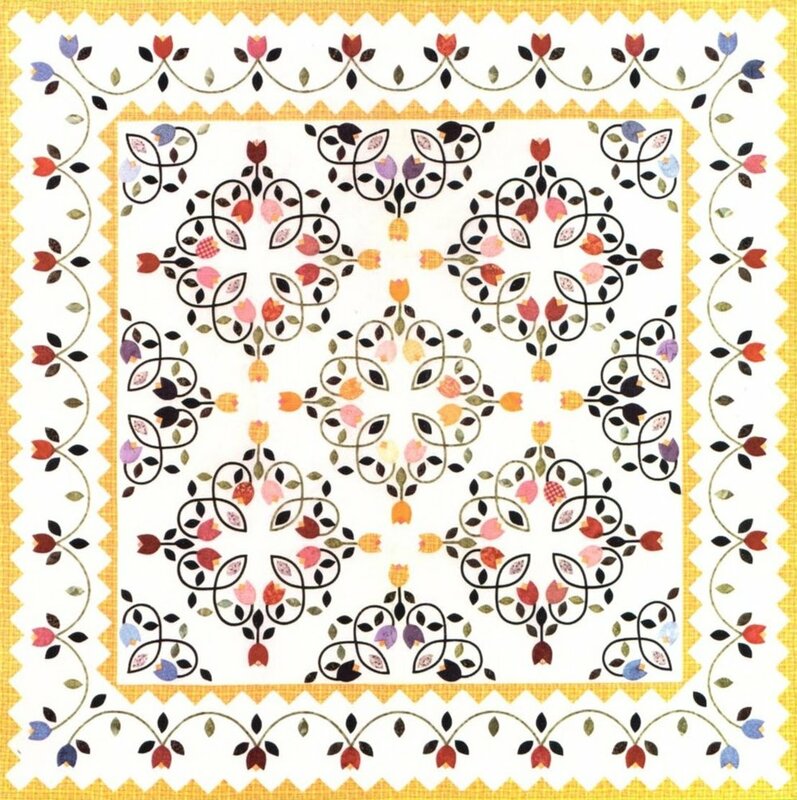 This class is a great introduction to Baltimore Album Quilt making. You will learn the basics of beginning appliqué as well as the dimensional technique of ruching, and hand embroidery. The focus is on the freezer-paper-on-the-bottom method of appliqué, but this class can also be adapted to include advanced students. Whether making just a pillow top or an entire quilt, Loopy Tulips is a fun project to introduce you to the joys of handwork. We will focus on the basic aspects of appliqué: stems, inside and outside points, and gentle curves using the freezer-paper-on-the-bottom method of appliqué. We will also explore color placement as a way to add a secondary level of design. Daffalilies is a whimsical project in which the design focus shifts from flower to stem. You will experiment with two different appliqué techniques as well as learning a simple hand-embroidery stitch. We will also discuss the ways in which color and value can influence a dynamic design. Dizzy Daisies is a dynamic project in which stems are the design focus. You will learn the more advanced freezer-paper-on-the-top method of appliqué, as well as how to make super-long stems and a simple hand embroidery stitch. With a limited color palette and a little bit of whimsy a delightful effect will be achieved. Purple Poppies is a striking project that will take your appliqué skills to the next level. You will learn how to construct super-narrow stems and master the tiny circle all while using the advanced freezer-paper-on-the-top method of appliqué. We will then finish it all up with a delightfully curvy border treatment and a little bit of sparkle. This class provides everything necessary to become a hand quilter, from a discussion of the objects needed for successful hand quilting to an understanding of the theory behind hand quilting and a strong beginning stitch. It is a fun non-project class for the beginner and those with more experience alike. Students who have never appliquéd are beginners. Students who have a basic understanding of how the invisible stitch is made, and have worked on at least one project, are intermediate. Students who have appliquéd several things and are mostly looking to perfect their technique are advanced. A half day workshop is 3 to 4 hours in duration and full day workshop is 5 to 6 hours in duration. Each workshop is limited to 25 students with an additional fee of $20 per student over 25. The items to be supplied for each class by the Guild are listed along with the corresponding supply lists. Workshop fees are $250 for a half day, and $400 for a full day.